Full disclosure: I am so not the target demographic for ‘Five Feet Apart’, a mushy, three-hankie weeper that is aimed squarely between the eyes of every 15-year-old girl with a crush on Cole Sprouse (Jughead in ‘Riverdale’). Even typing the words “so not” doesn’t come naturally to me. 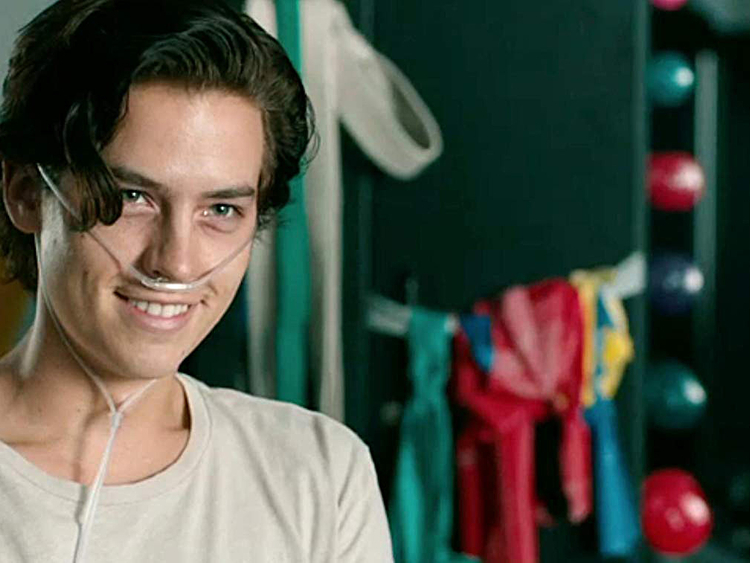 Set in a hospital, the romantic melodrama centres on the unrequited romance between two 17-year-old cystic fibrosis patients, played by the 26-year-old Sprouse — all fluffy hair and brooding, faux-adolescent intensity — and Haley Lu Richardson, who, at 24, is one of the best and most appealing actresses of her generation. But this movie is not for us fans of Richardson’s work (in “Support the Girls,” “Columbus,” “Split” and “The Edge of Seventeen,” to name a few). Richardson may be the best thing about this Velveeta-slathered heap of lukewarm cliche, but she is merely a vicarious vehicle for thwarted teenage longing directed at the bad-boy dreamboat heart-throb of countless high-school-girl fantasies. And if you aren’t caught in the throes of those fantasies at this very moment, in your real life, you’re probably not going to find much to like here. Richardson plays Stella, a girl who falls in love with a boy she literally cannot touch, thanks to what is known as the “six-foot rule,” a real medical standard that recommends that CF patients give each other a wide berth and wear face masks to avoid cross-infection. Stella is in the hospital awaiting a lung transplant, and down the hall is Will (Sprouse), another CF patient participating in the clinical trial of an experimental treatment for a rare but life-threatening bacterial infection. If she happens to catch it, that will rule out Stella’s transplant. Stella is an obsessive-compulsive rule-follower, with her own YouTube following for her chirpy series of educational CF videos — which also conveniently help with the film’s exposition — and Will wears his morbid cynicism (almost literally) on his sleeve. His face mask, naturally, features a death’s head grimace. If all this sounds like a bummer, yes, it is. The film’s emotional climax, in which Will and Stella engage in some beyond-risky behaviour, is almost a horror movie for germaphobes. But it’s not all gloom and doom. In a nod to romcom tropes, Stella even comes with a gay BFF, played by Moises Arias as a moderately charming fellow CF patient, prone to wisecracks and accidentally sitting on his call-button, sending the nurses into panic mode. Just don’t get too attached to the character, if you know what I mean. Is ‘Five Feet Apart’ trite, familiar and shamelessly manipulative? Of course. There’s even a scene in which Will and Stella strip down to their underwear and show each other their surgery scars and gastrostomy tubes, meant to show off their vulnerability. All it really proves is how far the filmmakers are willing to go to jerk your chain. But is it terrible? Before I answer that question, I’m going need to see some form of picture ID. ‘Five Feet Apart’ releases in the UAE on March 21.